When I was in college I was proud of how hard I worked. I started at 6 AM just as the coffeeshop opened, spending most of the day studying, then attending class before working a part-time job until late at night. People told me I had a great “work ethic” when I got into the workforce, which I took as a compliment. In hindsight, what they meant was “that new person is here a lot and looks busy as hell”. In school when I was told I had a good work ethic it simply meant that I studied for long hours in the library and took a long time making my papers just so. Now I am a professional “knowledge worker” in software development, a field in which you can work hard for 10 hours and then figure out a better solution ten minutes after waking up from a nap. Working as a manager is similar: not doing something smart now can cause months of work later. The rules have changed: how I work matters more now than how much I work. What matters is getting the right answers, not the total of questions answered. Working long hours is not always a bad sign, earlier in your career it can be a great boost to spend extra time learning and building professional experiences. And when you are starting something you have to work harder to build momentum. If you were asked to estimate some work and you concluded that it would take between a week and two weeks, and were then told it needed to be done three days from now or the world would end, what would you do? The first time I heard it I remember thinking that it probably created the impression that they were interviewing at a company that required long hours. The tone of the question, to me, sounded like “how many punches to the face can you take?”. But once I started hearing the answers I realized that you can learn a lot by how people respond to this question. It is an unexpected maturity reading. I would brew some coffee and just work until it was done. I once worked for 26 hours in a row. I would get it done no matter what or who stood in my way, including you. No matter what, I would get the job done – you can count on me. I would bring my sleeping bag to work, it is always in my car for this reason. I would ask what was three days away – what is the driver of the deadline? I would see if we could hire people – my brother in law might be able to help, he is a good man. I would ask why I was asked to estimate the work if there was a hard deadline that had to be met. I would sit down with the requestor and brainstorm ideas for how to speed up the effort by cutting out inessential work. I would sit down with the customer and make sure I understood the problem they were trying to solve – maybe I had estimated a solution to the wrong problem. I’d let them get away with that once, and then avoid that manager if possible, especially late in the week. If we couldn’t solve it, and it was a real do-or-die situation, I would try my best to get it done within reason, and then in the post-mortem discuss how we got into this situation. If the pattern continued I’d keep pushing for the team to improve, but if I found it was just a cultural issue in which every deadline had extra false pressure I’d have to reassess whether this company was the best place for me. My version of this question is basically: Do you default to thinking first then working or working first then thinking? Do you understand the downsides of just working a lot of hours under pressure? They will take the right amount of time to figure out what needs to be done; they will ask a lot of questions to understand the proper context where the work exists so they can make smart micro-decisions. After the work is done, they will seek feedback and provide honest and tough feedback on the process itself with the aim of making everything easier the next time. Work ethic is much more results-focused in my mind now, and means working smart and not just working hard. It speaks to long-term efficiency and effectiveness and not to anything else like how-much-you-want-it and how-much-you-will-give-up. You care enough about the work to give some of your best energy to it, want to get better at it, care about waste during it, work hard when required, and think-then-work smart by default. When you work from home, where you live matters more. When I used to work in Alpharetta [a nice suburb of Atlanta] I knew all the good bike trails, sushi restaurants, and gas stations that carried Sour Skittles. After all, I would spend a good 10+ hours there most days, with the end of the day being spent in Woodstock where I actually lived. Since I worked in Alpharetta we would sometimes head that direction on the weekend and have our kids play in parks or attend church. Will my laptop get stolen if I have to go to the bathroom? Will the smell of overcooked Starbucks ever come out of this bookbag? I wonder if the laws of physics allow for the Usher song that is playing to be any louder or more noticeable as background noise to my conference call? Did that woman at the table next to me really say she is thinking of switching to hot yoga over room temperature yoga, and did her friend really try to talk her out of it for twenty minutes? Coworking has some added benefits over a coffeeshop as well: no kids, more professionalism, and the chance to cross-pollinate. Because the people at a coworking spot are there to get stuff done, and not just to have coffee or conversations there is a greater focus and a more upbeat energy. Working together in this way also groups you with like-minded people – after all those without traditional offices tend to be the single-person companies, the startups, the craftsman, the troublemakers. If you work from home and occasionally get the “I have to get out of here” itch, I’d recommend Coworking over Coffeeshop. Standing desk for the win. It isn’t in the standing configuration, but you can use your imagination, geez. For the young folks, or pillow fights. Chair from the future, and the past. They are open this month in a soft launch phase, with memberships starting soon. Everything is essentially free right now, with coffee and memberships happening near the end of March 2017. Check it out – and please ignore the man working from one of the desks surrounded by empty Skittles bags. Can you learn anything from a vlog? Vlogging, “video blogging” – fascinates me. Not the idea of me doing it – how it feels to watch a vlog, and what it might change long-term. I started watching vlogs after I saw my kids watching them. We let our kids use the YouTube Kids app for a bit each day, and they watch popular blogs such as Shaytards and The Engineering Family. I also watched every day of Casey Neistat’s vlog for almost a year and showed many of them to my kids. I was a long-time fan of Casey’s Youtube channel (it was my only subscription for years) after seeing a video about his functional office and hearing him complain about the way the intern had built one of his shelves. I loved the attention to detail, and recognized the desire to have everything you need within an arm’s reach. The interesting thing about watching Casey’s vlog is that I legitimately missed it when I stopped watching. When I returned to watching it later I was surprised to see that his daughter had, as children do, gotten older. The sensation was one of seeing an old friend after a few years. But I don’t know the Neistats. When I heard that he had sold Beme to CNN I was happy for him in a deeper way than if I had read a blog post about a popular blogger selling his company. The bond was greater, the intimacy higher. It used to be that we read each other’s blogs to see what was going on in other people’s heads and to learn from their mistakes. Blogs were the teachers and the quality of writing created influencers. Now we listen to snarky musings and jokes on twitter, and fewer people read. Video is the next wave of extreme followership, and it is very different than previous formats in a few key ways. My new favorite vlog takes the camera home but also teaches: Nathan Kontny. The intimacy that this builds is strange, raw, and powerful. When Nathan explores an idea related to his business, I’m listening. As a paying Draft user, I have read on Ninjas and Robots (his well-named blog), but his deep credentials aren’t why I’m listening. His transparency on the vlog lends him the authenticity that you can’t get on a blog no matter how self-deprecating your “about” page is. He starts filming before he gets all cleaned up for the day and mentions how he has “parenting insomnia”, that his family is sick often, and mentions when his young daughter has a tantrum. While the fact that he is a father doesn’t seem related to his work, it somehow matters deeply. I’m listening to his stories because of the greater context I see of his daily life and family; honesty in one area indicates honesty in another. And he tells some interesting stories that feel more real within this context. I believe that vlogging is the way that the next generation of “influencers” will emerge. For software engineers, this might mean that the ones with the personality to pull off a daily vlog might have more influence than they do today. Should all developers go get haircuts and take that terrifying improv class? Probably not, but vlogging might turn into what doing a tech talk is now: a right of passage for those that want to move to the next level of influence. There are some interesting implications here regarding personal usage. You can’t watch 10 vlogs a day, even at the 6 to 9-minute standard that seems to have been established there just isn’t enough time. So a winner-take-all system will develop in which you most likely watch one, and occasionally binge on the rest like TV shows. While Casey Neistat’s vlog was interesting, I found myself wanting to know more about Beme and thus eventually got tired of hearing about drones, skateboards, and pep talks and stopped watching. Something like Nathan Kontny’s vlog matches my interests more directly – daily stories of business or personal challenges that I find relevant to my life and work. I look forward to it every day. I wrote this article about some approaches for effectively determining if someone will mesh well with your existing remote team over at the Buy Sell Ads publication. They have an entire Remote Life series that is worth reading through. I was interviewed for a piece discussing how you should treat recruiters [in summary: follow the golden rule]; this post ended up being a bit controversial as many tech workers think that recruiters are wasting their time, proving my point. If this is interesting to you also see The Three Laws of Robotics (for tech recruiters) and How to deal with robots and get your poodle a job . Remote vs. in-office software teams: Which is better? This is a great summary article about the pros and cons of allowing distributed work; my upcoming book is mentioned as a partial solution to some of the problems. If you are new to thinking through this issue many of the surveys and books mentioned are great starting points on the options and challenges you will face. When you work alone you get stuck. Whether it be a hard problem, a heavy lunch, or just a bad interaction with resistance there are times when you find yourself in a rut and need to force your way out of it. If there is one global law of productivity it is that of momentum: once you are working well, it is easier to keep going. Likewise, when you are in one of these ruts you have to spend extra energy to get going again. I’d like to call out one simple technique that I used to keep momentum going and climb out of these holes: small, daily tasks. One of these things is a secret. This technique is simple: you have a handful of 5 – 10 minute tasks that you would love to do daily. If you get stuck, do 1-3 of these to get your mind back to making forward progress. These small tasks are not real breaks, but rather refreshers. If I’m stuck on a hard problem I can take a break (with permission) and do 10 pushups, or go for a short walk, or meditate, or go read something. When I come back I no longer feel stuck since I was doing something, some forward motion. After the tasks are complete it is much easier to then shift the positive momentum back into the work that you need to get done. This technique is different than the people who recommend you get up and run 10 miles and then write three pages, then work on your side project, then put another brick on the orphanage you are building. Even on the worst of days you can find time to do a few of these. At the end of a sub-par day you can say “well at least I went for a walk and drank some water, plus those pushups”. I know it is probably intended to be funny, like the Oatmeal’s, but I’ve seen it used on Twitter pejoratively (like most things on Twitter). It seems to be making fun of people who work from home. This view says that remote workers don’t do anything but watch Jerry Springer and grow hair; they act like they are unemployed. This myth is dangerous because it takes a bunch of things that do not matter to actual work and use them as weapons to paint the subject as a loser. This is the traditional attack – remote workers are not effective. What type of worker starts work in the afternoon? Most of the day is gone by then! Well, maybe. If you work to your energy then the time doesn’t matter does it? If I could change this image I would add another little blurb: “Might have done more real work than you today”. I love hanging around with my kids because they say so many things that don’t make sense. They sound of wise crazy poets. Yesterday while walking with my daughter she looked up at the sky and said birds are so happy, but they have sun in their eyes all day. I thought about this and smiled and she smiled at me. We were on our way to dropoff a picture she made into a neighbor’s mailbox. Not all birds have sun in their eyes all day of course, they fly beneath the clouds down here with us, but it reminded me of the common saying every cloud has a silver lining which I often hear applied to mean: “from every bad thing, there is some small, good thing”. This is not the meaning of the phrase, although it is the common usage. Silver lining refers to the fact that the sun is always shining above the clouds, and you can see this on the edges where it makes it shine brightly in silver. Every cloud has a silver lining means that the cloud’s days are numbered, that the heat on the other side – with the same intensity and consistency as on a sunny day – will move that cloud away and it will be sunny again to you. The week between Christmas and New Year’s Day is typically a change of pace for most people – even if they don’t go on vacation – and a socially acceptable time to reflect and make large changes in your life. I am intentional about goal-setting and have found that having a framework – a simple set of questions – to guide the reflections helps. Here are a few ways to help you reflect on 2016 and plan for the new year. How do I want to change? What’s something new we should add? What’s something we’re doing that we don’t need to do anymore? What are we already doing that’s going well? What would it look like if I took this completely seriously? This provides a good list of actions you can take to get a little better at each role, and it helps you focus and prioritize certain roles over others. #5 Morning Journal Questions, but for the entire year. I am grateful for ____ [3 things]. How could I have made 2016 better? 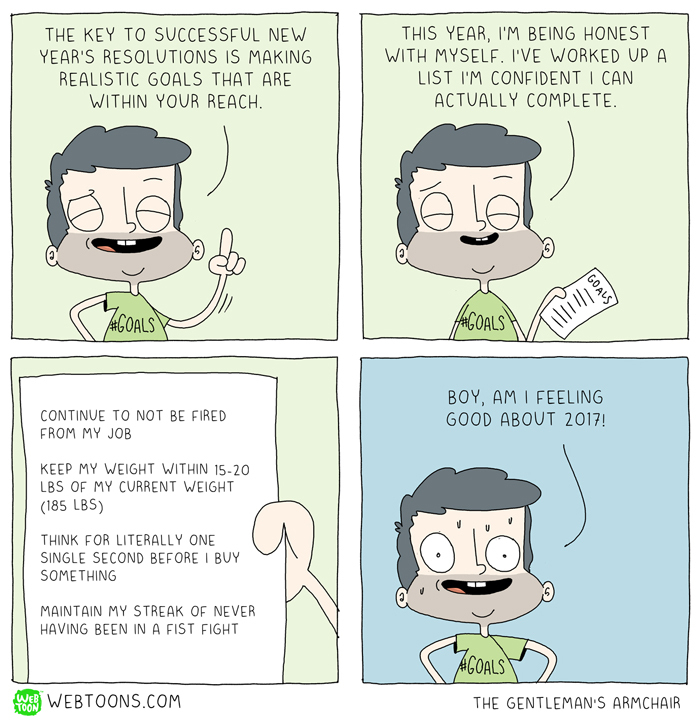 Finally, some extra inspiration and some humor about resolutions. Good luck! Play to your Strengths – Well, Sometimes. You hear, and most act upon, the advice to “learn all you can and improve your weaknesses.” Traditional education focuses on being well-rounded and not having any major knowledge gaps, so we get used to pushing through learning things we don’t pick up quickly. But there is another idea, most commonly learned by taking an assessment like StrengthFinder, to instead figure out what you are good at and then focus on it intensely. The thrust of this idea is that effort multiplies in your areas of power – a week of work improving your public speaking when you are naturally good at it pays off more than a month of working on a weakness. Combining these, most of us just shore up the very important weaknesses but play to our strengths. Seems simple, well maybe not. For example, I am good at solving problems, and I am (relatively) calm in a (work) crisis. Because of this, I’m not afraid of a small crisis. This is a blindspot. I’m not going to prevent these things from happening as aggressively as someone who freaks out and jumps out of a window when a bug is found in production. This means that my strength is also a weakness – if I “play” to this strength then I, without knowing it, might make it more likely to happen so that someone like me is needed. I used to work for an executive that had a similar strength: he was very good at convincing employees and clients to not resign or walk away from the contract. He excelled in last-ditch efforts and high-pressure situations. Being good at talking people back into the building is a good tool to have, but he seemed to use it an awful lot. Without meaning to do so, he did a number of other things that seemed to cause situations in which his particular set of skills would always be needed. Maybe if it happens three times it is partially on you, brother. I can manage more projects at a time than the average person. I read 3-5 books at a time and can keep track of where I am on each one. I have seen old friends years later and will continue conversations with them that we had two years ago and they will not remember them. I can mentally bookmark things and then return to them. This means that I might say “yes” to too many things at a time and create situations in which I over-allocate myself, thus making it a weakness. It also means that I might multi-task, a common way to not be productive, more often than someone than can’t do this easily. It is a weakness and a strength. You have to be careful to not play towards your strength, but instead, recognize when they are truly needed and then use them.